Regent Kim Snyder presents daughter Megan with the Outstanding Junior Award for 2018. The Urbana Chapter Daughters of the American Revolution met Jan. 7 at the First Presbyterian Church, Urbana. Fourteen chapter members were present. Regent Snyder welcomed members to the annual Chapter Master Report session. She then conducted the DAR ritual, which included the Pledge of Allegiance, American’s Creed and singing of the national anthem. President General’s Report: Judy Kathary highlighted a goal as stated by President General Ann Turner Dillon. The message is that every office in the National Society is a volunteer position, and each DAR member should help their next replacement do the best possible job. The National Society benefits when we all work together. National Defense Report: Judi Henson reported on the fact that drones can pose a threat to national security. Research is underway to facilitate the detection and countering of drones. This is one step in strengthening our nation’s defense against unmanned aerial vehicle attack on persons or facilities within the United States. Secretary’s Report: The minutes of the December 2018 meeting were approved as written. Treasurer’s Report: Judy Brooks presented the Treasurer’s Report, which is filed for audit. Regent Snyder announced that we have been asked to sponsor two additional awards for the Champaign County Fair, bringing our total to 6 trophies sponsored in 2019. Regent Snyder presented the very special award of Outstanding Junior for 2018 to Megan Snyder. Congratulations, Megan! 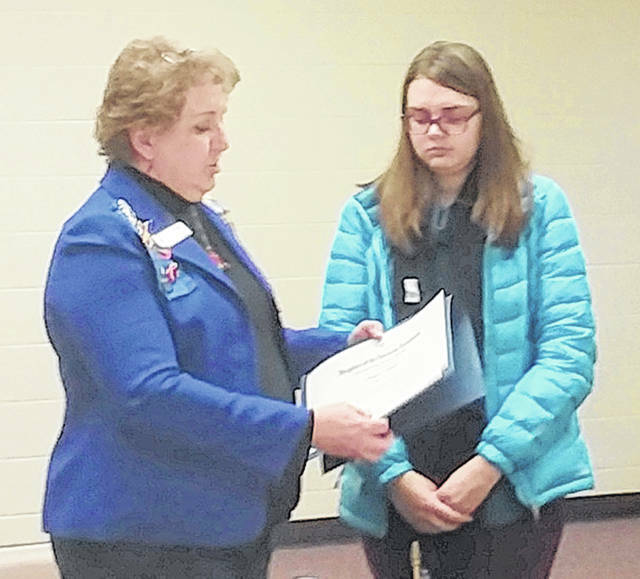 Members were thanked for their efforts in making the chapter’s first annual Wreaths Across American project an overwhelming success. A total of 628 wreaths were placed on gravesites and 528 were sponsored. We hope to lay wreaths on the estimated 1,700 veterans graves in Oak Dale Cemetery in December, 2019. Registrar’s Report: Dona Tullis reported the chapter has 86 members and 5 prospective members. Judith Bunnell has been approved as a new member. The Urbana Chapter was very saddened by the death of longtime member, Fonda Lou Eaton, on December 7, 2018. Service to America: Judi Henson reported that a total of 4,696 hours have been reported for the 2018 year for Urbana Chapter DAR. Business was suspended for the group to diligently complete the Chapter Master Report. The meeting was adjourned at 3:35 PM. Hostesses for the afternoon were Kim Snyder, Kathy Detwiler and Pat Detwiler. Peg Neiswander asked for discussion on details for the next meeting which will be held Monday, February 18, 2019 and will feature our presentation of the American History and DAR Good Citizen Awards. Submitted by the Urbana Chapter Daughters of the American Revolution.